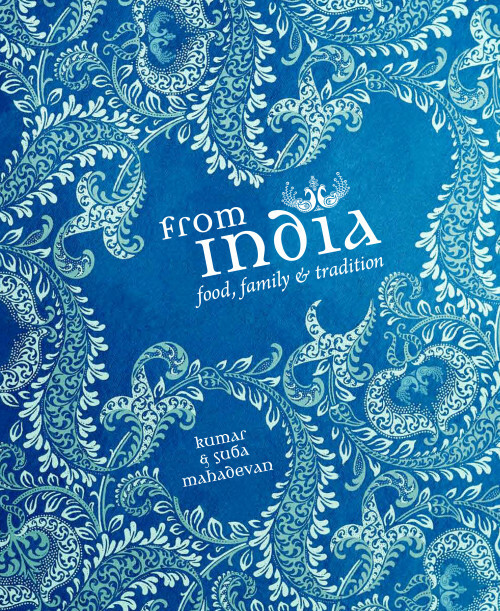 beautiful cookbook, From India: Food, Family & Tradition (giveaway open to Australians only)! Have you ever been asked to do something that’s a little out of your comfort zone? You think you kind of want to go ahead and jump in, but you’re just a little afraid things won’t work out and you won’t be able to contribute anything of worth. You end up saying “sure, I’ll participate”, and then you’re stuck – you have to contribute something now, there’s no way out of it. That’s kind of how I felt when Nespresso asked me to participate in a cooking challenge to promote their newest limited edition Grand Cru – Monsoon Malabar, a bold, slightly salty coffee with woody and spicy aromas. I’m pretty good at coming up with recipes for Nespresso, but for Monsoon Malabar, because the coffee is from India, the recipe this time had to be inspired by India. I love a delicious curry, but I had no idea on this planet how I’d incorporate coffee into a savory dish (other than a friend suggesting I pair the coffee with beef), and I don’t actually know much of anything about Indian desserts. When I finished my kulfi mixture, I tasted it. It tasted very much chai-like, and coconutty, and it was really yummy. It was a little sweet, though. I continued, poured the mixture into little ramekins, froze them overnight and excitedly tapped the kulfi mounds out the next day. 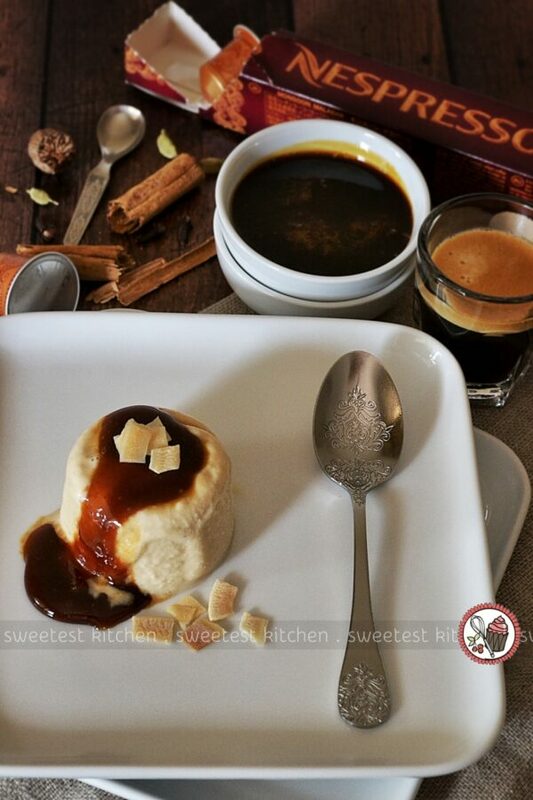 I made a little sauce to coat the tops – a dark palm sugar espresso caramel. Hm. The caramel didn’t work well with the ice cream. When the caramel got too cool, it got too hard to spoon over the kulfi. But if it was warm enough to drizzle, the caramel melted the kulfi. And the caramel fell off in chunks down the side of the kulfi. And to make it even more of a failure, the whole thing was just too sweet. I don’t mean just a little sweet. I mean sickeningly sweet. I couldn’t enter this pile of sugar into a Nespresso competition. I decided to start over. I kept my original idea, but omitted the coconut. This time, it’d be just plain chai kulfi. And I’d re-vamp the espresso caramel. It took even longer to reduce the milk for the kulfi this time. I added a bit of brown and white sugars, fresh ginger, fresh nutmeg, cinnamon sticks, whole cloves, whole cardamom pods and whole peppercorns. I let the mixture freeze in the ramekins overnight again. The next morning, I was on a mission. Nothing was going to go wrong. I tapped out the kulfi mounds so carefully. While they re-froze (because, inevitably, they melted slightly) I made a new espresso caramel, with sugar and water, and a good helping of Monsoon Malabar. This time, it was perfect; thick and syrupy. It draped perfectly over the kulfi. You better believe I tasted, and re-tasted, and even re-tasted this, before I took pictures of it! I had four kulfis in total, and I had one mostly gone by the time I considered it was good enough to photograph! I wasn’t sure if I wanted to add crunchy coconut chips to the dessert. It tastes fine with or without. They add a bit of texture, as well. If you did ask me, though, I’d prefer without. Have you ever had a dirty chai before? I haven’t. A friend suggested that I make one for this challenge, but I didn’t. However, the idea of the dirty chai kind of twisted around a bit and I ended up with this kulfi. A dirty chai is basically a chai latte with a shot of espresso. I’m sure I’d like one if I tried it. But how does the dirty chai kulfi taste? The chai kulfi is gorgeous. It tastes just like a chai latte, and despite being an ice cream, it’s still so warming. You could just eat this plain with no espresso caramel sauce. But if you do add the sauce, well, let me warn you, if you don’t like drinking plain espresso with no milk, you probably will not like this sauce. It’s pretty intense. It does taste wonderful with the chai kulfi, however, and I’d highly suggest you give it a try. It has a lovely syrupy, even slightly chewy, texture, and packs a strong coffee punch. Personally, I love how dark golden it is, it’s beautiful! 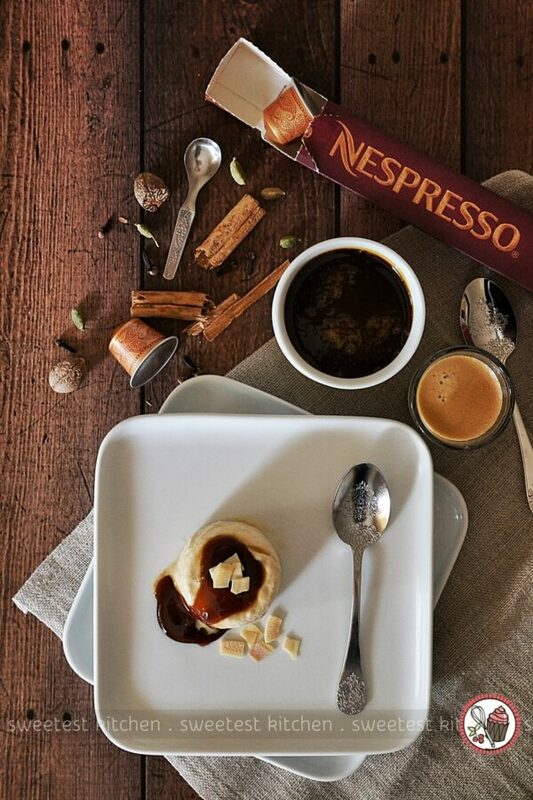 Next week, each participant’s photo of their entry will be posted on the Nespresso Facebook page, where Nespresso fans will vote for their favorite entry by “liking” the photo. The most creative recipe out of the top three will be chosen by Chef Kumar Mahadevan. I can’t wait to see the other entries! But wait, that’s not all! If you came here looking for the giveaway, here’s what you need to know. The kind folks at Nespresso are giving away a signed copy of Chef Kumar Mahadevan’s cookbook From India: Food, Family & Tradition! This is a gorgeous book full of delicious Indian recipes; I was so lucky to have also received a copy. I haven’t yet cooked from it, but I have a few of the recipes high up on my to-make list! 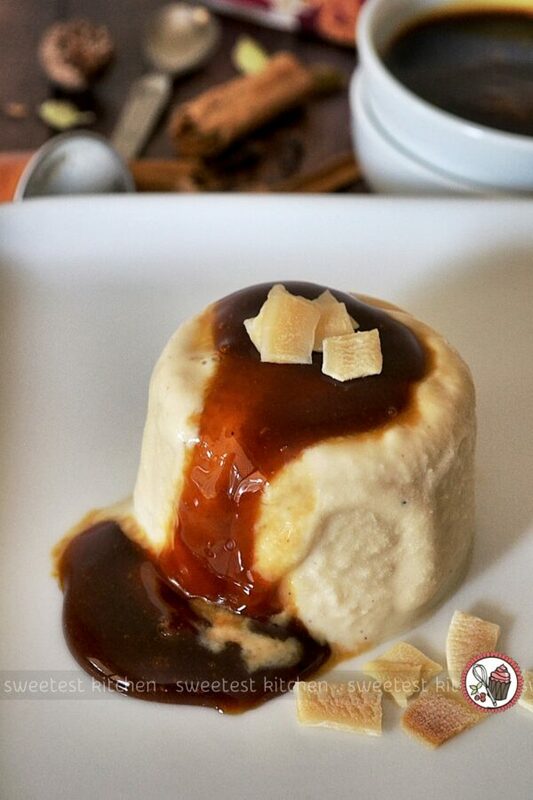 An interesting twist on the Indian kulfi, with the addition of chai spices and espresso caramel drizzle. Start this recipe the day before! For chai kulfi: Roughly crush spices in a mortar and pestle. Transfer the crushed spices to a small bowl, along with the sugars, and set aside. Bring milk to a boil for 3 minutes in a saucepan over medium-high heat. Be careful it does not boil over. Reduce heat to medium-low and cook, stirring constantly, until the milk has been reduced to 2 cups. This could take up to 2 hours. Add spices and sugar and simmer for another 7 minutes. Transfer milk mixture to 4 small ramekins, cover tightly and freeze overnight. The next day, dip the ramekins for about 30 seconds in hot water and invert the kulfis onto a plate. Place in the freezer while preparing the espresso caramel. For espresso caramel: Place sugar and 50ml of water into a saucepan. Bring to a boil over medium-high heat, stirring to dissolve sugar. Brush down the sides of the pan with a wet pastry brush to remove any remaining sugar and cook over medium heat, without stirring, until a golden caramel color (5-10 minutes). Watch carefully, as once it starts to turn golden, it'll turn really fast. Add espresso carefully, as the caramel will spit and bubble, and stir over low heat for 2 minutes, until the caramel is thick and syrupy. Set aside to cool, about 30 minutes. To serve: Remove kulfi from the freezer on the plate. 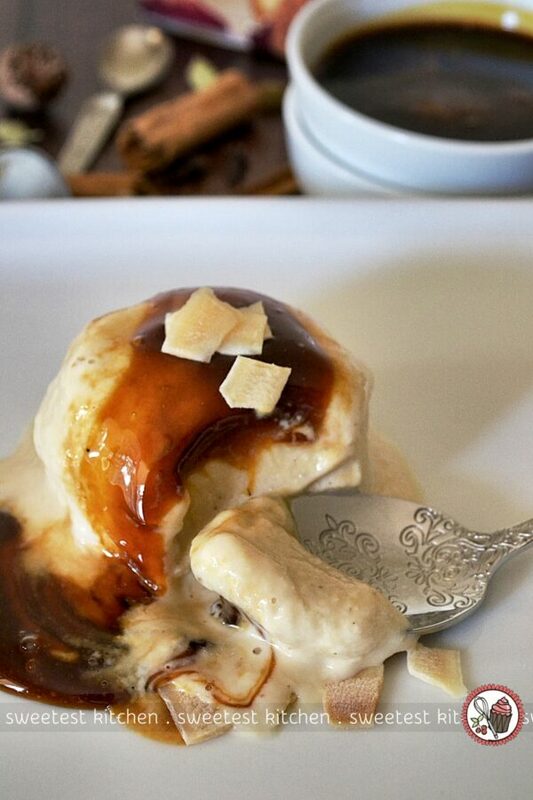 Drizzle cooled espresso caramel on top of the kulfi. Sprinkle with coconut chips or anything else you think will taste nice, or just leave plain. Serve immediately. Your kulfi looks absolutely delicious. A friend’s lentil and potato curry is my favourite Indian dish–wonderful for breakfast the day after being made.